Today I will introduce you to “Miso Marinated Grilled Salmon”. It is very easy to make and incredibly delicious! I use only 4 ingredients. The preparation time is quick (but you need to marinate for at least an hour) and the cooking time is only 10 minutes!! In addition, I cook the salmon in a pan lined with parchment paper so there is no messy cleanup! Marinated food with miso is very common and has a long history in Japan because it can be stored for a long time. We marinate various vegetables, meats and fish. The miso marinated vegetables are basically eaten without cooking and the miso marinated meats and fish are cooked and served. All ingredients have a lot of miso flavor and are slightly salty so very delicious!!! Lately in Japan, TOFU and EGG YOLK are becoming popular ingredients to marinate with miso. This miso marinated grilled salmon is great for dinner by itself and also is great with your salad! The marinated salmon can be stored for 3 days in the refrigerator. So you can marinate some salmon fillets at once and cook lunch or dinner for your busiest days! Cooking takes only 10 minutes! Mix the marinated sauce and marinate salmon for an hour in the refrigerator. Cook in the pan lined with parchment paper. Categories: Fish, Miso, salmon, Uncategorized | Tags: beauty, cooking, dinner, easy recipes, fitness, gluten free, quick lunch | Permalink. Today I will teach you “How to make Authentic Homemade Miso Soup” with recipe video and detailed PDF direction. It is very easy to cook and has great flavor and wonderful taste, but I am sure you have never tasted authentic miso soup at most of restaurants in the US. One of tips for cooking miso soup is to use great Dashi stock. I use different Dashi stocks depending on ingredients in my miso soup. I like to use bonito Dashi stock for vegetable miso soup. I tend to use kelp or anchovy Dashi stock for seaweed and seafood miso soup. Sometimes I use blended Dashi stocks which is very flavorful! If you follow a vegan diet, you can use kelp Dashi stock. I have some homemade Dashi stock recipes in my blog. But you can also use instant Dashi stock powder to save time. There are a lot of great ones in many Asian markets and also on Amazon. I want to tell you one more tip to cook delicious miso soup. Basically I use 2 Tbsp. of miso paste for 2 cups of Dashi stock. But you can use less or more miso paste. I tend to use a little bit more miso paste than 2 Tbsp. for vegetable miso soup. I use less than 2 Tbsp. of miso paste for seafood miso soup because I can enjoy the seafood flavor! Miso soup is an important dish in the Japanese diet. Miso (Soybean paste) is a traditional fermented food product. It is a very nutritious food, and Japanese say it may help keep the doctor away. In fact, there have been many studies of the beneficial effects of Miso on human health. I like to eat miso soup for breakfast more than anything else because I feel energy, my stomach feels comfortable and my head becomes clear. I think my body gets ready for school or work when I have miso soup in the morning. In this recipe I use tofu. I like tofu miso soup because it is the quickest and easiest miso soup recipe! You can use any vegetables such as onion, potato, spinach, Daikon radish, mushrooms, carrot, bean sprouts, and so on. You can also use any seafood and seaweed for miso soup such as Wakame seaweed, clam, freshwater clam, oyster, lobster, and so on. Boil Dashi stock and cut tofu. Dissolve miso paste. Categories: Miso, soup, Uncategorized | Tags: beauty, blog, breakfast, cooking, dashi stock, Delicious, Diet, Digestion, dinner, fitness, Food, Food blog, gluten free, Health, Healthy, Japan, Japanese food, Lunch, miso soup, Nutrition, Quick, Recipes, Tofu, vegan, Vegetarian | Permalink. Today, I introduce you to fried eggplant. This dish is my mother’s original recipe. She used Miso paste and ginger so it is very nutritious and delicious. Eggplant is low calorie and has polyphenol, which works as an antioxident. Miso is a fermented food. Recently, there have been some studies suggesting that fermented foods can improve our immunity. Japanese, who live longer than people from any other country, eat a lot of fermented foods, such as Umeboshi (pickled plum), soy sauce, Miso paste, Katsuobushi (dried bonito) and Natto. Ginger is also very nutritious and healthy. Ginger helps our blood flow, helps speed up our metabolism, and blocks the oxidation process inside our body. This dish has the great flavor of ginger and juicy chicken and it doesn’t have a strong taste of Miso paste, so I am sure everybody can enjoy it! Categories: Fried, Miso | Tags: Chicken, Delicious, Eggplant, Ginger, gluten free, Healthy, Homemade, Japan, Low calorie, Miso, Nutrition, Traditional | Permalink. Miso soup is also an important dish in the Japanese diet. Miso (Soybean paste) is a traditional fermented food product. It is a very nutritious food and may help keep the doctor away. In fact there have been many studies of the effects of Miso on human health. 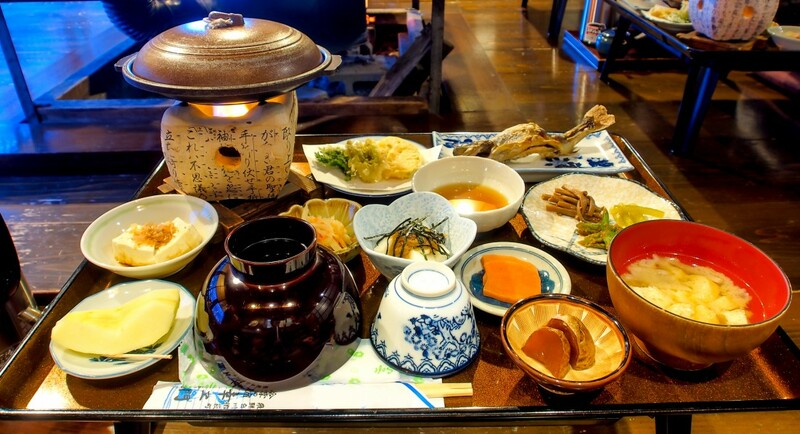 The basic arrangement for many Japanese meals is called “Ichi-jiru, San-sai”, and consists of one bowl of cooked rice, one kind of soup and three vegetable or fish side dishes, so most people have miso soup during every meal. Here I will introduce onion and shiitake miso soup. You can cook many other kinds of miso soup such as tofu and seaweed, Japanese radish and deep fried tofu, potato and onion, clam and green onion, and so on. Depending on the ingredients you want to use you may need to slightly change the amount of miso and the amount of cooking Sake based on taste. Categories: Miso, soup | Tags: Asia, gluten free, Healthy, Homemade, Japan, Nutrition, Onion, Shiitake, Soybean, Soybean Isoflavone, Traditional | Permalink.